BRIGHTER THAN YOU THINK - The innovative technology makes the image brighter and more intense than ever before. 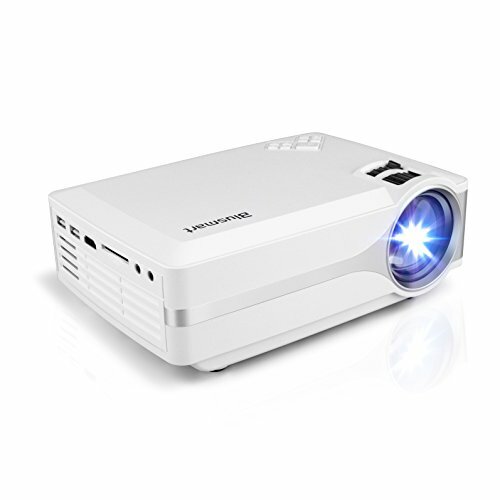 With 2000 lumens of brightness and 2000:1 contrast ratio, the Mini Projector creates a real cinema experience at home. Please kindly note that the Blusmart LED-9400 Video Projector is not suitable for presenting business data in PPT, Word, and Excel. REDUCED NOISE, IMPROVED PERFORMANCE - Thanks to upgraded cooling system, the Video Projector reduces apparent fan noise and gives an outstanding performance among the competitors. The projector makes a little bit noise due to cooling systems works, but it will not affect watching experience. CUSTOMIZED SCREEN SIZE - By blending your actual needs and preferences with presenting environment around you, this Portable Projector allows you to adjust the screen size from 30 to 150 inches (with throw distance from 1.2 to 5 meters). You also can display your content with best projection distance from 2 to 2.5 meters with the screen size of 130 inches. VERSATILE MULTIMEDIA SUPPORT - Equipped with HDMI/AV/VGA/TV inputs, USB port, SD card slot, and 3.5mm headphone interface,the Home Projector supports almost all multimedia content you want to play. HDMI input: for PC/DVD/VCD/PS3/Xbox connection; AV/TV input: for TV and video device connection, USB port: for USB storage device connection. ALWAYS FULFILL YOUR EXPECTATIONS - The Movie Projector comes with 3-year warranty (replacement or refund) and lifetime customer service. Please feel free to contact us if you have any question or need any further help. Wherever you are, we are here to serve you and meet your expectations.